Journal Jottings : Life - 21-27 Nov. 2017: Rain, Arctic Blasts, & Feeling Stupid! Life - 21-27 Nov. 2017: Rain, Arctic Blasts, & Feeling Stupid! The continuing journal of my everyday life - a record for future generations. A quiet time compared with last week's activities, but a brilliant one for blogging. Amazing what you get done, when the main computer is down. Caught up on the domestics, and tidied out drawers and cupboards. At least I have the I-pad for emails and the Internet. 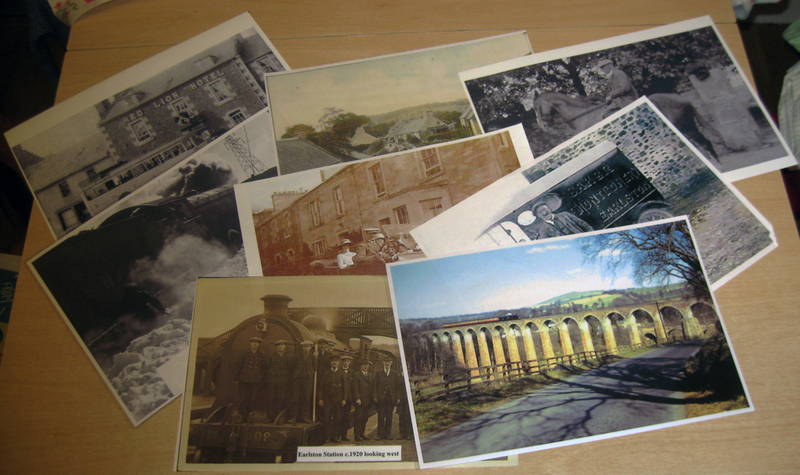 At last got round to sorting out on the kitchen table the 160+ photographs back into their folders, after the Auld Earlston exhibition three weeks ago. No incentive to go out as dreicht, damp and dark most of the day. We felt so stupid! D. came and in 30 seconds had sorted our computer problem!! N. must have caught this little switch on the underside of the screen (which we never even knew was there) - and inadvertently switched it off. N. felt so embarrassed at calling D. out, but it could easily have been me causing the fault! I had three blog posts in draft form, but I finished and published last week’s Journal Jottings and made good progress on Auld Earlston’s “Wheel Women of Earlston” looking at the early women cyclists - and motor cyclists. I enjoyed researching the social history. Baked for the Wednesday Club - I have to admit baking is not my natural forte. When I agreed to join the catering team for the tea, I thought it would encourage me to widen my very narrow repertoire - Wrong! I still cannot be bothered spending time on baking, and I would certainly want to eat my fair share of any of it - and that is not recommended for my waistline. Nh. round after school and we had an hilarious time playing "Articulate" - a bit like Trivial Pursuits, but you have to describe or act out the clue for others to guess the answer. Nh. loves doing the Action option. I had to act out "Buckingham Palace" and "Blackpool" which was challenging!! Great fun for us all - I highly recommend it. Lazy morning, once I had packed my baking for this the afternoon. Posted the latest Auld Earlston blog. Got my delivery of the wool I had ordered online for the KAS (Knit a Square) African Project - very impressed as it came in a lovely muslin style bag - took me back to what I picked up working at the Tourist Board about marketing, adding value to a product and wowing the cusotmers - I was wowed! 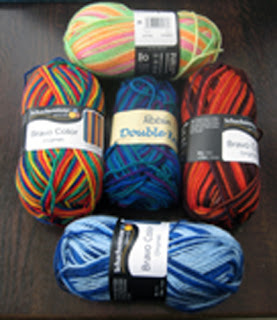 I love knitting with the variegated/self-patterning wool as you never know quite how it is going to turn out. The Speaker at the Wednesday Club was from Stable Life, a very well worthwhile local charity that helps vulnerable youngsters by involving them in working on the land and with horses. Plenty of goodies on the cake stands afterwards. Walked there and back in pouring rain - it has never stopped all day. A good night for me on TV for a change. Woke up to find it was dry with glimmer of sunshine. 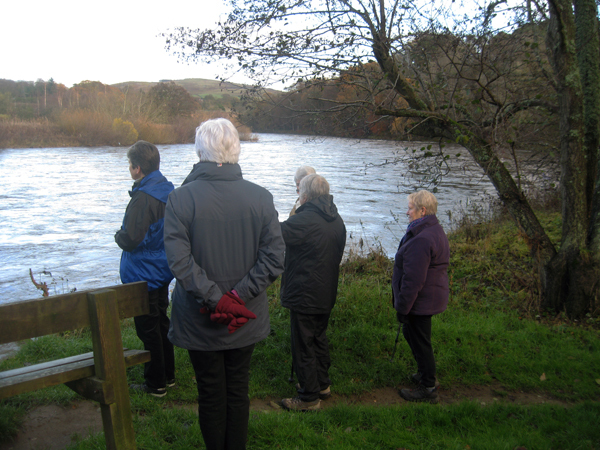 Our "Walk It" group went across to Tweedbank and enjoyed a walk around the loch and down to the high, fast-flowing river - still plenty of colours in the foliage. Home to a good blogging session. 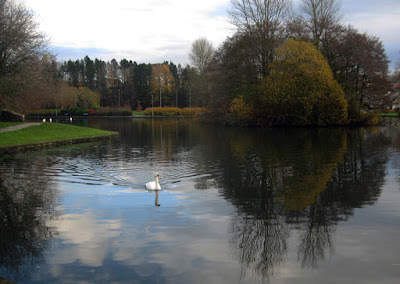 Posted "Women on the Home Front - Service in the Face of Sorrow" with the WW1 tale of Maggie Laidlaw of Hawick. We needed to go into Galashiels for the bank and a cobbler, so we took the opportunity to have lunch out at our favourite place - Quins. 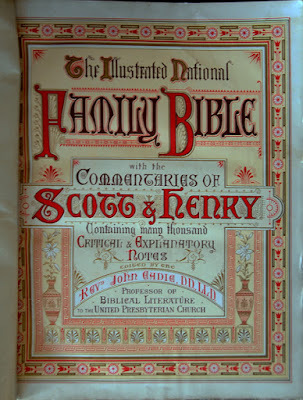 Home to another good blogging session - posted "The Gift of a Family Bible" about my great grandfather, in response to the November Blog Party Thanksgiving Challenge. Bitterly cold again - 4C. A day off the main computer. A good news story for Scotland for once - we actually beat Australia convincingly at rugby!! My favourite Saturday night entertainment - Strictly Come Dancing - I will have withdrawal symptoms when this finishes in a few weeks' time. Lazy morning. Fired off a quick blog on Family History Fun to try and boost figures for this new blog. 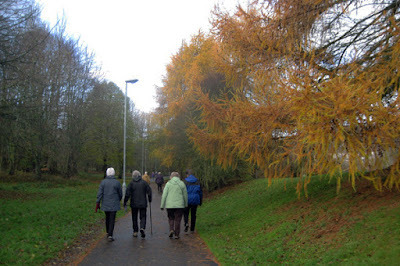 We decided to get some fresh air after lunch, but even though we were well wrapped in hat, scarf and gloves, we soon turned back it was such a chill raw wind - where was the sun we were promsied for today? Papers are sayng that Scotland is in for some Arctic blasts!